It's nothing new, and it offers very little nuance, but it succeeds in thoroughly engrossing you in the paranoia. If you're able to make it through its reasonably long-winded runtime, you may find yourself rewarded with its go-for-broke ending that merits some forgiveness towards its less creative elements. From the the directing collective referred to as RKSS (Anouk Whissell, François Simard, and Yoann-Karl Whissell) that brought us 2015's Turbo Kid, Summer of 84 is another nostalgic tribute to 80s cinema, albeit in a slightly different vein. This time around they ditch the gonzo blood-soaked viscera of their previous work for a slow, atmospheric, moody approach solidly anchored in reality, devoid of almost any gore. It's a film that wears it's influence pinned to its studded leather jacket, which is both a blessing and a curse. Essentially, it's a mashing of Stranger Things and Rear Window with a dash of Super Dark Times, but it also shares similarities with Fright Night, IT, Super 8, and Disturbia in its adolescents questioning their "normal" neighborhood and what may lie just beneath the surface. Its derivative nature may be enough to sink its hooks into the nostalgia-driven viewers, but it will not cast its spell over everyone on this factor alone. For me, its imitative nature wasn't overly obnoxious, but its score from Canadian synthwave duo Le Matos was a little too close to Stranger Things' soundscape to be ignored, which did irk me on numerous occasions. However, the film finds its sweet spot in the witty juvenile banter between our group of clichéd teen protagonists and the is-he-or-isn't-he quality to the next-door neighbor (played by Rich Sommer). While arguably none of these characters are thoroughly fleshed out, the ragtag gang of misfits (played by Graham Verchere, Judah Lewis, Caleb Emery, and Cory Gruter-Andrew [respectively in above image]) manage to be pretty charming and entertaining. Their banter and their presentation is completely believable, and much like Super Dark Times, I never doubted for a second that they were 15-year-old kids. The film flirts with making them rounded by showing us brief glimpses of their home life — some distanced arguing between parents here, a single-parent mother passed out on the couch with a bottle of pills and alcohol there, and a few mentions of a divorce — but it never really comes back to this in a full-circle kinda way. Some characters, like the ex-babysitter girl-next-door (played by Tiera Skovbye) don't really service the plot at all, but only seem to be there to complete the cliché in total. This is no slight to the kids, who give applause-worthy performances (particularly Emery for his authenticity and pathos), but more so speaks to the weaknesses and flaws emanating from the undercooked screenplay by Matt Leslie and Stephen J. Smith. As far as performances go in the film, Rich Sommer takes that cake as next-door neighbor police officer the boys suspect of murder. He strikes a smart balance between friendly and creepy loner, which is enough to keep you guessing. Sommer's has definitely outshined his minor roles (his most notable probably being Mad Men's Harry Crane) with his effort here, as underwritten as it may be, and proves that he's more than just a one-note chord. As far as direction goes, Summer of 84 is smooth and clean, but offers nothing in particular that stands out from the similar films already mentioned. There are a few montages that contain a 80s-style zooms that I would've liked to have seen more of, but for the most part their direction is very straight forward with minor flourishes. The film relies heavily on jump scares for its source of suspense generally, which usually manifest into a comical moment, but it finds some tension in these moments that are amplified by the performances. A lot of the flaws here, however, can be overlooked or forgiven, once it's third act hits — and boy does it hit hard. The ending goes to some chilling places, and not quite in the ways you'd suspect. It moves a layer or two deeper than I thought it would, given the majority of the film up until the ending sits at only the surface level. While it flounders around a bit in the denouement, the dark finale amplified my overall enjoyment. 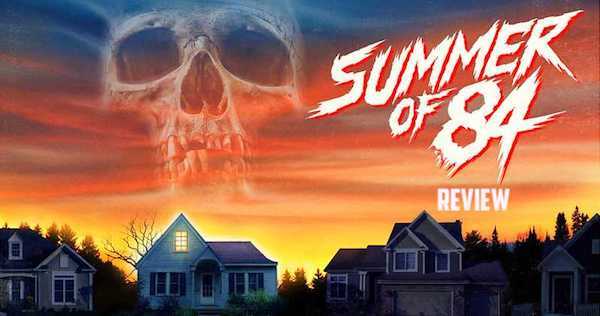 All in all, there are films that have explored this idea more effectively, but Summer of 84 has a fun, entertaining quality that is held together by its group of teen actors and a stellar performance from Sommer. It won me over more and more as it progressed, and surprising ending kicked things up a notch. If you're trying to satisfy that 80s-era itch, or can't wait for the next season of Stranger Things to post, Summer of 84 may just hold you over. Rating: 3 serial killers next door outta 5. What do you think? Was the film too similar to its influences? Did it work effectively for you? We want to know. Share your thoughts and feelings in the comments section below, and as always, remember to viddy well!